The friends we were about to make on this 70.3 journey would stay with us for the rest of our lives. We would experience a rollercoaster of emotions as the programme progress. I have probably experienced more ups and downs in the past ten days than what I have experienced during most of this programme. 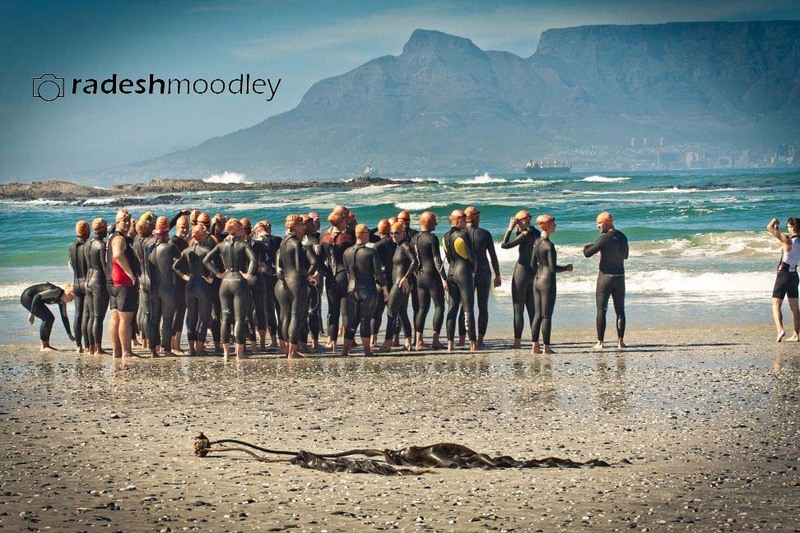 I’ve heard a lot about the Langebaan Lagoon Challenge, and although I had toyed with the idea of participating, I didn’t really give it any serious thought. It wasn’t on my official race calendar (what with the distance to the race venue and all), but Sofie wouldn’t let it go and constantly reminded me to enter. In the end, I’m glad I did. It’s probably one of the most beautiful road races I have ever had the pleasure to ride. The rolling hills made it challenging and the stiff head-wind didn’t exactly add to the fun, but hugging the Langebaan Lagoon for the majority of the race – as well as some awesome wildlife spotting – made for some spectacular views. I was even impressed by the gees at the water and food stops, and made a point of having a quick stop at each one and thanking the water point volunteers and route marshals for their contribution to making this ride so great. But the finish didn’t come easy. The finish line and timing mats were (in)conveniently positioned at the top of a hill, known by all as The Mamba. It’s a deceivingly nasty little hill. It looks pretty innocent as you approach it, but then you realise that it’s getting harder and harder to maintain your candence, and the only thing that helps to keep you going is some good old-fashioned mental stamina. The ups & downs of the route, finishing off with the MAMBAAAAAA! This race also gave me the perfect opportunity to practice my overtaking skills, to get used to 70.3’s strict non-drafting and related overtaking rules, as well as to get used to riding on my own for most of the time (again, the nature of 70.3 dictates that there must be a 10m gap between you and a fellow rider). It’s amazing what kind of things can float in and out of your mind as you ride. Chanel told us that she used the alone time to plan her wedding (the irony being that there isn’t a wedding on the cards). Stace thought up nicknames for those of us who were still known by, well, our first names. Sofie is now known as Die Hard (her numerous accidents, prangs, crashes and bloodshed have proven that she has more staying power than Chuck Norris). I am now referred to as Phelpsie – for my new-found mad swimming skills. Me? I had a series of internal monologues. 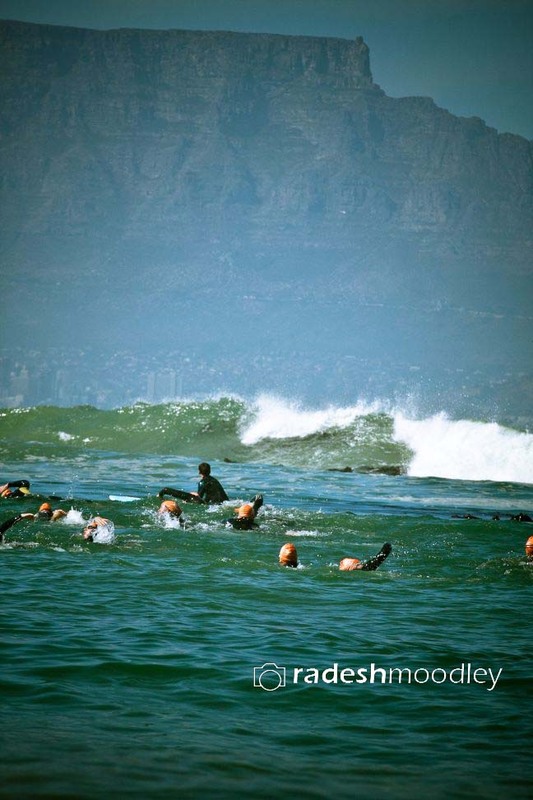 I kakked out my dad for dying before he could see me (1) swim in (2) the sea at (3) 70.3. I planned my daughter’s wedding cake, as well as the contents of a series of letters I want to write to my kids and hand to them when they turn 18. I also found myself repeating the same phrase over and over when the going got tough, and it will now become my mantra for the rest of the programme. I will also write it on my arm with permanent marker and stick a print-out onto my top tube on race day so that I can see it while I race. We started. We finished. We got the tortoise medal. 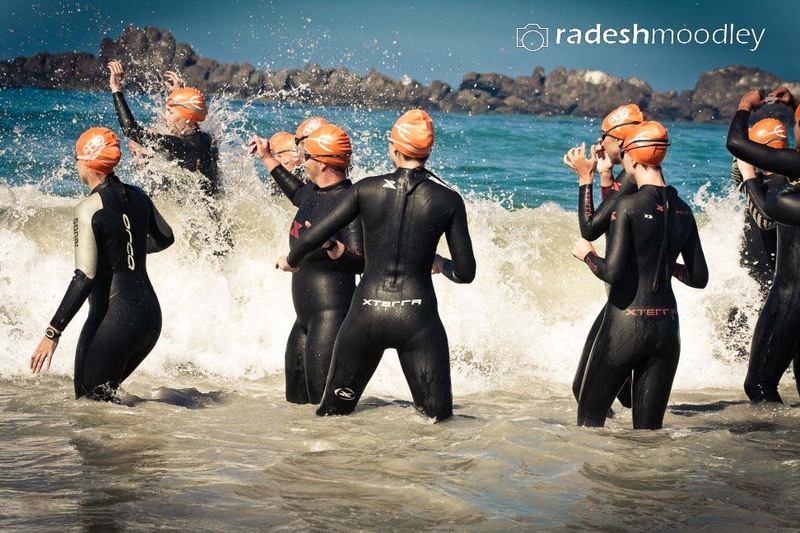 Still basking in the awesomeness of the previous week’s BSG tri, my full 1,6km swim loop in the canal and the previous day’s great ride out in Langebaan, I was confident that our first real OW sea swim at Big Bay would be, well, nothing less than awesome. For starters, I got a little lost on the way to Big Bay (don’t ask) and arrived after everyone had had the the chance to dip a toe in the water. Then I looked out over the waters of Blouberg strand and felt afraid. The waves were huge. And we had to swim really far. Through kelp. Past rocks. And all the way back. We had a bunch of lifesavers surrounding us to make sure we would be OK. I managed to stay with the group but suddenly I found myself swimming and swimming and swimming in exactly the same spot without moving an inch. I lost my swimming buddy in the process and could only look on in despair as the gap between me and the group got bigger. The lifeguard that stayed by me had to coach me on how to get unstuck from what I can only imagine was a strange little current that kept me in place, and by the time I got out of the water, everyone was on their way back in. I was about to get on with it when I looked at the direction everyone was swimming in, when my gut suddenly told me to stay where I was and rather walk back to the start point with two of my team mates. 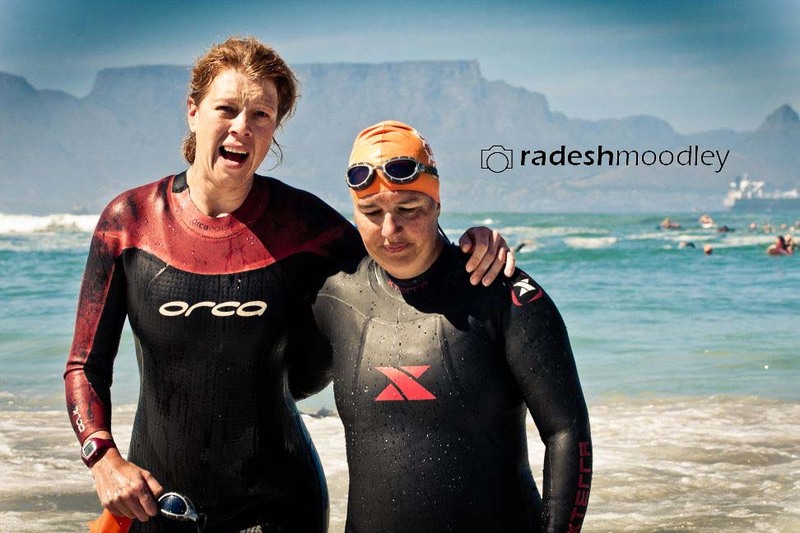 I don’t know what happened next in the water, other than the stories I heard as my traumatised friends stumbled out, and a brief summary in Stace’s latest blog post. In a nutshell, a freak set of waves knocked the lifeguards off their boards, separated the group sucked a few friends over rocks and caused some panic in the ranks. 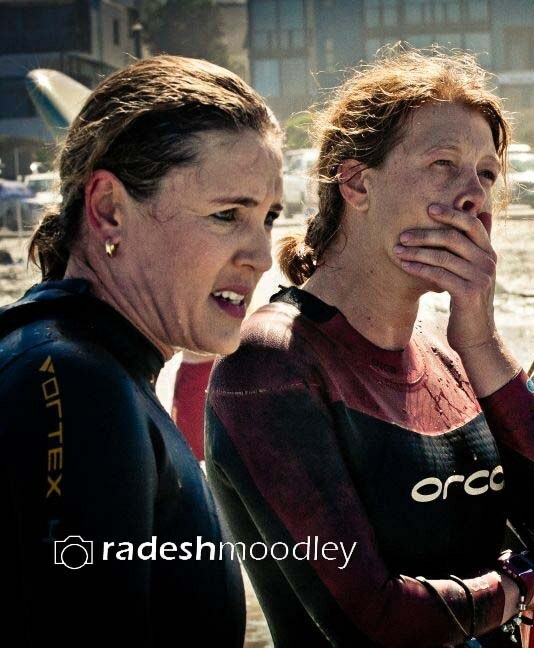 Radesh’s pictures captured the raw emotion of those who got caught in the action. And to be honest I was glad I had listened to my gut on Sunday. However, the day was enough to convince me that I wasn’t really cut out for this Ironman stuff and that I should rather stick to something I’m actually good at. Like baking. I missed the Tuesday track and Wednesday morning cycle up to the Glen and was really bummed about it. To make it worse, I had hoped that I would be able to ride Die Burger Cycle Tour (we may not ride our own events), due to the fact that the nature of my job keeps me busy AFTER – and not during – the race. But the answer was no and I was disappointed. 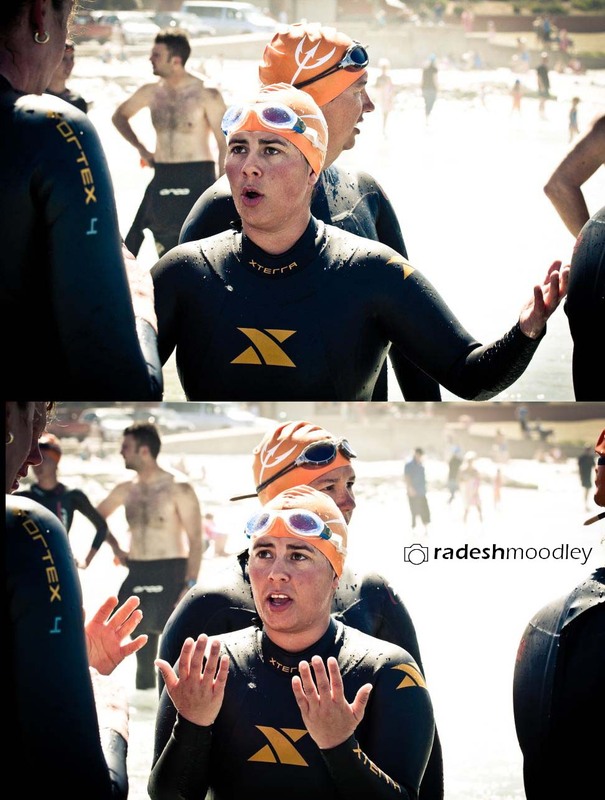 Overall I found myself in a deep pit of negativity and had constant freak-outs about 70.3. This resulted in a bit of an ugly cry (a rare occurrence these days) on Thursday after we swam at Clifton and I kept on being dunked by waves. It really felt like I had taken 10 steps backwards in my swimming and it was hard to deal with the fact that I was once again ripped out of my comfort zone and placed in a situation that caused me incredible fear and emotional anguish. The big swell also made me feel really sea sick and I struggled to find a rhythm and relax in the water. Once again, my incredible friend Sofie came to the rescue and made me do two more loops. That’s our Sof for you. She makes you face your fears instead of allowing you to wallow in your own self-pity. That evening, the three-way BBM discussion among Sofie, Meg and I went into overdrive and I realised that Meg was also going through a tough time, struggled with her own slump, and worried that her training was suffering due to work commitments. And while Meg and I were having our respective melt-downs, poor Sofie was stuck in the middle, trying to tell us that everything would be OK. I did a full loop and could, for the first time, swim around the island twice like everyone else. I was on a high for the rest of the day! ’nuff said! Our scheduled training was moved to the 25th due to bad weather on the Saturday, but I was stuck at home, suffering from serious FOMO. Due to my move to the IT team a few months ago, I was no longer required to work at the Coronation DC race village in Swellendam. Which meant that I had to be on standby at home, reliant on someone else for information, in order to update the website. I was depressed about being stuck at home while my colleagues had to endure extreme weather. Somehow I was convinced I would have felt better if I were there to experience mother nature’s wrath with them. I have finally found the sweet spot in my race nutrition. In short, I no longer eat before a swim. Instead, I take small sips of my special energy drink mix ahead of the swim and refuel in transition and on the bike. Similarly, I don’t have solids before I ride, but instead make myself a power-packed dairy-free smoothie and top it off with a Vitrace tablet. The results have been astounding and I find that I have all the energy but without the bonk. As I am vehemently against any energy gel on the market, I had to find a way to get the best nutrition without eating solids. I’m passionate about wholefood nutrition but also found that I get bloated quite easily and often feel very uncomfortable before a race. Making dairy-free smoothies (a mix of fruit, seeds and nuts, and almond- / peanutbutter) has made a big difference in how I feel before a training session or a race. Anyhoo, back to my training ride… I felt stronger than usual and had a great time on my bike. My knee still felt a little dodgy, so I joined Sofie on a brisk knee-saving walk instead of the run we were supposed to do. I found out that I am allowed to ride Die Burger Cycle Tour this Sunday. I’m extremely grateful for my team to allow me to do this and am sending special positive vibes to my manager for making it happen. On the flip-side, this is going to be a very challenging week. Da Husband is out of the country until Sunday night, leaving me to play single mom for a few days. This seriously affects my training and I will miss key morning sessions as I need to prepare the kids for school. My only hope is my spinning bike, which is gagging for a ride in any case. In addition, the kids have all sorts of functions, prize givings and karate gradings to go to this week, and I will be playing mom’s taxi. I really miss training and my friends during times like these. Right now I just need to get through this week so that I can have a fresh start this coming Monday. Meanwhile, I came across this cool quote. There seems to be an online disagreement over who originally said it. And while I don’t care whether Charles Darwin or Charles Darrow spoke this famous line, I will hold onto it as I weather the storms lashing my home and life.